Simple show about starting up a cheer leading club. Nothing too fancy and innovative, but it hits in all the right places for a show to relax to after a long day. The main character is too wholesome and good. The rest of the cast do well to support her antics and desire to help people. It's so weird I have been missing out in this anime season so much I couldn't resist the characters charmed and cuteness. So memories or nostalgic, from scenes in a few episodes remind me of a lot of anime from the past and present wise it is very funny and heartwarming to the point I laugh my but this season. Despite the reviews in my anime list are very low I say screw it this anime is a gem of happiness and laughter. I enjoy the character kohane she such a Neptune from Neptunia in a good way very endearing and lovable way without the fourth wall jokes which is a great thing with her excitement. I usually watch anime with adblocker but these anime makes me not do that which is rare. A charming, high energy high school SoL. Once more we find the "create a high school club" story you've probably seen a million times, but with something else in mind. If I had to say something bad about Anima Yell it would be the story. There's nothing quite special or surprising about the story, so just go along with it or you might be disappointed. Repetitiveness may be a problem later on. If I had to say something good about Anima Yell it would easily be the lines. Clever and funny lines make for episodes sure to make you smile every time. The lines make it easy for the VAs to deliver charming performances that are both adorable and energetic. Animation is well above average, with movements and flowing motions that have an elegance to them if you look closely. The cast of characters is one of the strong points in the show, with personalities that are hard to hate. A lively soundtrack is subtle, but makes it's presence felt with great consistency. Art is soft and colorful, making for some pleasing scenery both in the backgrounds and on characters. Overall it's a common SoL high school like any other you'd find out there, but with a different theme and lovely cast. If you hate these types of shows it certainly would fall under the moeblob category, but I find it more charming than most and many characters are instant favorites. Calling it average isn't exactly an insult for this one, that's what it wants to be and it does it in a way that's fun. Favorite characters: Kohane, Hizume, Uki. I give it a 8.5/10. TL;DR Version: Moeblob start a high school club routine. Awesome cast and creative lines. Nice visuals. Gets repetitive, but not hollow like many similar shows can feel. Solid comedy. A usual school anime, but cuteness pakced to 11/10. This may look like another trash school show, but it's more of a really cute comedy/school show. There's just a lot to love, personally I have found a lot of great gifs from this show because of the small ideas or facials that get expanded because of the animation. Other than that though, this is a pretty copy paste school show, MC is a tad stupid but lovable, side kick one is insecure but loyal, side kick two can't let go of the past until MC says hi. The only reason I really give this 4 stars is because of just how damn cute all the scenes are and how likeable MC is. 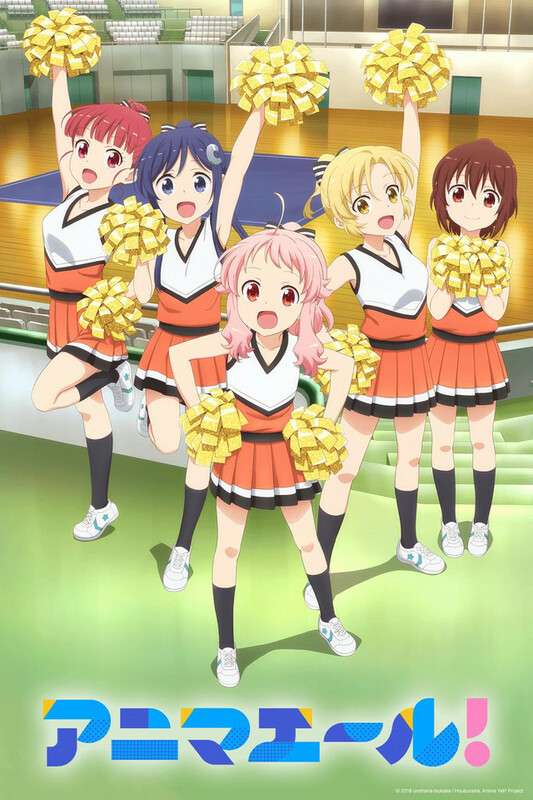 As you can probably guess by the title, Anima Yell is about cheer leading. The story is about Kohane Hatoya falling in love with cheer leading and attempting to start a club about it. While the plot line sounds like so many others, it stands out from the rest by blending multiple genres into one. The main plot seems to be a sports anime style, but rather than creating conflict through getting better and competing as an underdog, the conflict comes from the characters' own personal setbacks. This pairs with the yuri undertones and mixes with the school comedy genre to create a unique experience. Don't we all love chairs? CGDCT anime. Tropish, and not terribly original. But you'll feel cheered up as you watch these girls come together to form a group that are just out there to do what they enjoy doing. There was moments where I felt like we were walking the standard paces of this kind of anime, but that doesn't mean it's not enjoyable. If you take a look at the cover/description and decide you're not going to enjoy it you won't. Simple as that. Give a cheer for Anima Yell! Anima Yell is a pretty typical club-themed cute-girls-doing-cute-things style anime. For all its lack of originality, it's a well-executed show that delivers exactly what it promises based on the cover art. The characters are likeable, the premise is fun, and the tone remains pleasantly lighthearted. The show does offer up just enough dramatic tension to add a bit of spice here and there, but it never becomes overbearing or ham-handed. And I actually appreciate that it doesn't trivialize the subject matter by over-inflating the girls abilities, especially compared to other teams with many years of practice. All in all, Anima Yell! is a good show - not great by any means - but worth a watch if you're a fan of the genre, or just need to unwind at the end of a long day. Watching cute-girls-doing-cute-things is a nice way to boost happiness levels, after all, and these girls brings that in spades. Anima Yell! is a so-called "slice of life" show but with story to tell, not "just another high-school girls daily life". Each characters have their own struggle to overcome - althoguh not too serious, not big deal at all , but that is the way teenagers being. Cute and fun to show to watch. The anime centers on Kohane Hatoya, a young woman who loves to be helpful to others. After she moves from middle school to high school, she becomes fascinated with cheerleading, and she starts a cheerleading club at her high school. Joining Kohane in her cheerleading activities is the experienced Hizume and Kohane's childhood friend Uki.